ANN ARBOR, Mich. – To help keep at bay health risks such as childhood obesity and early tooth decay, the American Academy of Pediatrics recommends limiting fruit juice in children age 1-6 to one serving per day. A new report from the University of Michigan C.S. Mott Children’s Hospital National Poll on Children’s Health shows that many kids in low-income families are getting more than the recommended amount of juice. The Poll asked parents of young children of all economic levels about their children’s juice consumption. 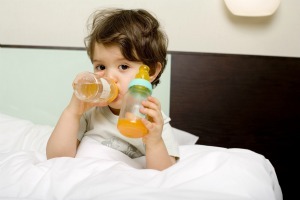 Overall, 35 percent of parents report that their children 1-5 years old have two or more cups of juice on a typical day – twice the amount recommended by the AAP. Of parents whose household income is less than $30,000 annually, 49% report that their children drink two or more cups of juice per day. Only 23% of parents with household incomes of $100,000 or more report that their children drink two or more cups of juice per day. These findings are concerning, Clark says. “Both childhood obesity and early dental problems are more prevalent in lower-income children, so the children we’re most worried about in terms of these conditions are also those who are drinking the most juice,” Clark says. Some parents may encourage their children to drink juice because it can help their child receive the recommended servings of fruit consumed each day. “Parents may think juice is an easy way for their child to get a serving of fruit, but it’s often difficult to pick out 100 percent fruit juice amid the sugar-sweetened juice drinks,” Clark says. The AAP recommendation for 100 percent fruit juice still is limited to no more than one serving per day. The Poll also found that 35 percent of lower-income parents said that their child’s doctor recommends juice. Website: Check out the Poll’s new website: MottNPCH.org. You can search and browse over 60 NPCH Reports, suggest topics for future polls, share your opinion in a quick poll, and view information on popular topics. The National Poll on Children’s Health team welcomes feedback on the new website, including features you’d like to see added. To share feedback, e-mail NPCH@med.umich.edu. Data Source: This report presents findings from a nationally representative household survey conducted exclusively by Knowledge Networks, Inc. (KN), for C.S. Mott Children’s Hospital via a method used in many published studies. The survey was administered in September 2011 to a randomly selected, stratified group of parents age 18 or older with a child age 1 to 5 (n=606), from the KN standing panel that closely resembles the U.S. population. The sample was subsequently weighted to reflect population figures from the Census Bureau. The survey completion rate was 58 percent among panel members contacted to participate. The margin of error is ± 5 to 11 percentage points.